Hailed by some as ‘the manning capital of the world’, the Philippines enjoys a reputation as a leading source of qualified seafarers. However, and surprisingly so, the country has never really been viewed as a major maritime hub – at least not in the same light as, say, Hong Kong or Singapore.It’s a situation that has long frustrated local entrepreneur Angelo Olondriz, who believes the Philippines has the potential to become a key location for shipbuilding, engineering and marine services and an attractive hotspot for recreational boat owners. “The edge we really have is in our workforce,” Olondriz tells Ship & Boat International. “Most Filipinos have English as their secondary language – this is crucial for foreign manufacturers and an advantage we hold over our ASEAN neighbours. We are 600 miles from Hong Kong, which is one of the bigger boating countries in the region. At the moment, there is a shortage of berths in Hong Kong: the Philippines could capitalise on this. It’s a promise that still needs to be built on with solid action and support, if the country is to seriously rival its ASEAN counterparts. Fortunately, Olondriz would appear to have the passion and drive to pull off this feat. In 2000, he formed Advanced Composite Systems, Inc (ACS), which manufactures the Hammerhead line of RIBs from its 1,300m³ facility in Subic Bay. 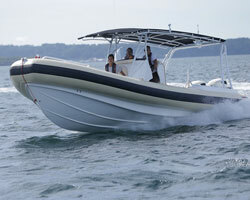 “We [currently] employ 32 staff and have a capacity of about 50 boats a year,” Olondriz reveals, adding: “We are looking for a new location to move the factory to, as our boat models are getting bigger.” Approximately 90% of sales are to domestic clients, though the group has also received direct orders from Hong Kong and, according to Olondriz, intends to undertake “more of an international push in the coming five years”. The Hammerhead range of RIBs comes in a variety of sizes and for varying customers – from weekend thrill-seekers to military/professional users, including the Philippines Special Forces. For instance, the 10m model features a displacement of 2.72tonnes and, when equipped with twin outboards, can achieve a top speed of 55knots. In addition to his work at ACS, Olondriz created the company Headsail Inc, which organises the country’s annual Sea-Ex boat show. Now in its 10th year (and scheduled to run between 5-7 October 2018), the exhibition has become a platform for boatbuilders, OEMs and service providers to network and promote their businesses. Headsail was also created to lobby for the interests of Filipino marine manufacturers at the governmental level. Naturally, to realise its long-term ambitions, the Philippines will also have to readdress its approach to maritime education and training. “We have great naval architects who are dealing with the larger shipbuilding side of the industry, but still not that many on the composite and pleasure craft side, ” Olondriz says. (A full version of this article is available in Ship & Boat International March/April 2018).